Category: Cape Cod Series - On Sale, Cape Cod Series - Single Glass, Combination Poly Roof/Glass Walls Greenhouse Kits, Feature Greenhouse Models, Free Standing Greenhouse Kits, Greenhouse Kits, $2,001 - $5,000, Single Glass Greenhouse Kits, More.. 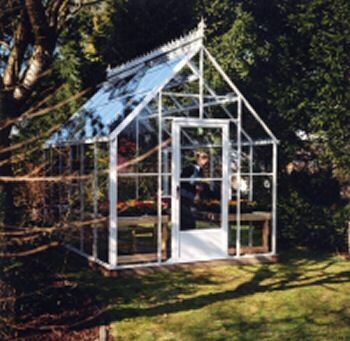 This feature Cape Cod, 8 x 12 glass greenhouse is on sale every day! All Cape Cod greenhouses have an attractive 12/12 roof slope. The Cape Cod Greenhouse kit an architectural delight, and it is sure to create a stunning focal point in any garden setting. Its high peak roof is designed at a 45 degree angle, providing spacious headroom for hanging baskets and taller plants. During winter months the roof will also shed snow more readily allowing maximum sunlight to enter the greenhouse. The Cape Cod 8 x 12 glass greenhouse is built to withstand harsh weather conditions. The durable aluminum frame comes with an attractive enamel paint finish. Large automatic roof vents provide air circulation and the wide storm/screen door comes with a key lock. Height to Center Peak 10' 2 1/8"
Add on the attractive Victorian Trim Package to enhance the charm and elegance of your victorian greenhouse. Your Victorian Trim Package can be selected in the Options Box below. Photo shown may not be actual size. Please note that shipping is not included. Please call 1-800-665-2124 to obtain your shipping fee or to receive a quote for any other size or paint color! Optional door upgrades also available.